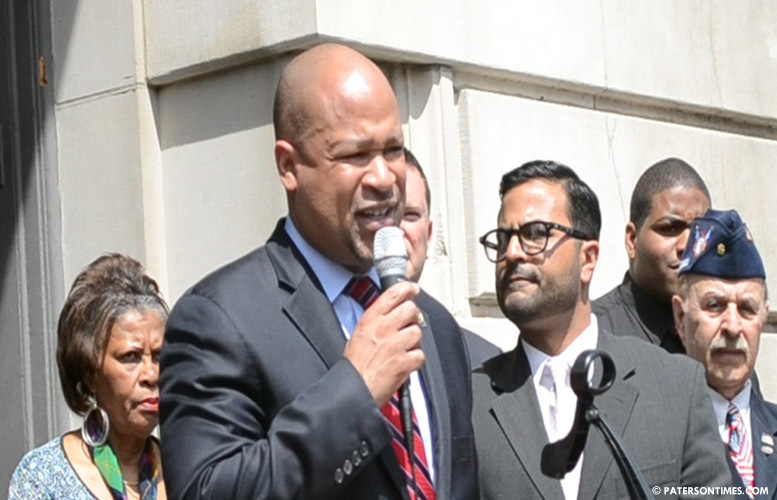 Popular coach and assemblyman Benjie Wimberly, who demurred in endorsing the 6th Ward councilman four years ago, has endorsed Andre Sayegh in the six men mayoral race. Sayegh received the assemblyman’s support last Friday at an event at the Hamilton & Ward Banquet Steakhouse in downtown Paterson. Wimberly cited Sayegh’s work in improving public safety, promoting economic development, and campaigning to bring together different ethnic segments as factors that led to the endorsement. Wimberly won a seat on the City Council in 2010. After a brief time on the council, he became the assemblyman for New Jersey’s 35th legislative district in 2011. He worked as a teacher and coached football and baseball teams at Eastside High School and Paterson Catholic High School. Wimberly is the city’s recreation coordinator. The endorsement ceremony last week was low-key. Four years ago, Wimberly was among a large group of Democratic Party leaders to gather at the steps of the historic City Hall to endorse Sayegh. Graddy’s words and the tense environment at the endorsement event forced Wimberly to deviate. He had joined his party comrades that day with the intention to back Sayegh for mayor. Some of Sayegh’s opponents reacted to the endorsement on Thursday morning. His opponents see this as a sign that the party is making a second attempt to control the city. Other candidates in the race are Alex Cruz, Alex Mendez, and William McKoy. Four years ago, there was a backlash against the Democratic Party. All of Sayegh’s opponents joined together to oppose him. His campaign is hoping for a very different outcome this year. “I believe he will move Paterson forward and make it a safer city for all our families,” said Wimberly. Sayegh is a whore. He is owned lock stock and barrel by Florio just like Torres was. If he wins and doesn't do exactly as he's told to by his master he will end up where Joey is.